Since 1995, Net Atlantic has been helping our clients communicate online with leading email and marketing communications. We have partnered with Lyris and StrongMail to offer our clients the finest solutions available to manage their email and marketing campaigns. Now small and mid-sized businesses can get the same powerful, comprehensive, high-end Enterprise-Level solutions used by Fortune 500 companies. We offer 100% USA-based telephone technical support from our business office, and help our clients with all aspects of their email and communications with customized training, videos, webinars, online resources, consulting, and personalized support. 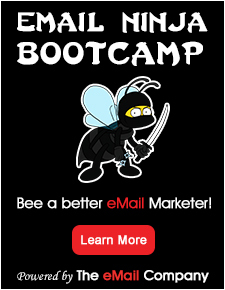 Businesses of all sizes and types use email marketing for total engagement. We offer a scalable solution to design, send, track, and measure the success of your email newsletters. With options like free HTML email newsletter templates, unlimited image hosting, A/B/N email split testing, dynamic segments, content blocks, database integration, web analytics integration, and whitelist monitoring, it’s an email marketing system that marketers and IT staff can both appreciate. Reliable service for any size list: Send personalized, targeted messages to millions of addresses at once, with message speeds of up to 900K emails per hour. Detailed reports for serious marketers: Check delivery, click-throughs, open rates, bounces, unsubscribes, and more via the reports dashboard in real-time. Convenient add-on services: We offer Email Advisor to help increase your delivery and response rates; Email Marketing Consulting Services to help you manage your campaigns; See Why Conversion Manager to recover lost revenues from abandoned shopping carts; and HTML email newsletter template design services. We also partner with Fresh Address to provide List Auditing and List Hygiene services; and Salesforce.com integration to help you tie campaigns to your sales activities. 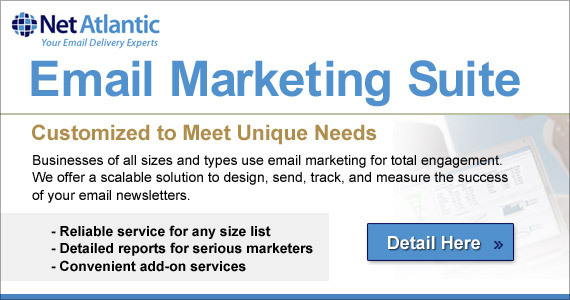 Net Atlantic offers you two versatile Email Marketing Service options. Choose from Professional, with high deliverability for HTML email newsletters and powerful campaign tracking and reporting, or Enterprise which adds transactional email automation and A/B/n split testing. For marketers with highly advanced sending needs, StrongMail On-Demand Edition includes built-in database integration, dynamic content blocks, unlimited segmentation, multi-level management, mobile text marketing, transactional email, social media tools, and web analytics. We’ve also added Net Atlantic Navigator, an intuitive, streamlined email workflow wizard that guides you through each step as you create lists, targets, templates, and mailings. 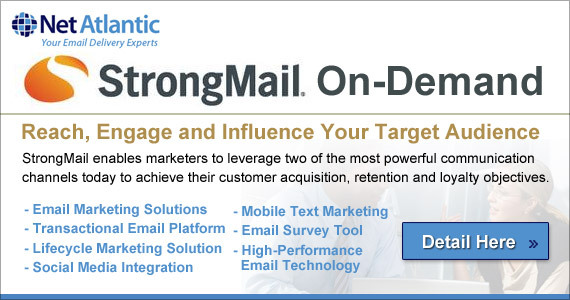 StrongMail’s email marketing solutions empower marketers to drive the highest value from their email marketing programs. Our wide range of solutions combine StrongMail’s industry-leading platform with the strategic and deliverability expertise to drive conversions, increase brand awareness and improve customer satisfaction. StrongMail’s transactional email platform enables marketers to take control of the branding, content and promotional elements of event-triggered email, such as order confirmations and shipping notices. A straight-forward integration with existing data sources and applications allows StrongMail to efficiently assemble and immediately deliver fully branded and personalized messages that properly reflect customer preferences, purchase history and previous interactions with your brand. StrongMail’s Lifecycle Marketing solution enables marketers to design and automate powerful, event-triggered email marketing programs with drag-and-drop simplicity. Fully integrated with Message Studio, StrongMail’s email marketing system, StrongMail Lifecycle Marketing makes it possible to easily launch welcome, cart abandonment, win-back and other multi-stage dialogs without IT involvement. Social Studio provides marketers with actionable metrics that go beyond the advertising-oriented metrics offered by competing solutions, such as number of impressions and increased reach. Social Studio provides detailed performance metrics all the way to conversion, enabling marketers to understand the true impact that each social media campaign contributes to key business objectives, such as driving revenue, subscriptions or downloads. StrongMail’s mobile text marketing platform delivers a true multi-channel messaging strategy by enabling marketers to combine email and social sharing. Text is a gateway to expanding the channels your subscribers use to reach you. With more channels, it increases the likelihood that your customers will respond, raising purchases and revenues. With Mobile Text Marketing as a powerful part of your multi-channel engagement strategy, your tool set is complete. Our Email Survey Tool, powered by SensorPro, is an enterprise-grade online survey tool. It allows marketers to generate rich customer survey data for use in highly targeted email marketing campaigns. Using the Survey Tool, you can easily create fully branded surveys that capture customer preferences and satisfaction metrics. StrongMail overcomes the challenges of high-volume email delivery with a highly scalable, reliable and manageable system that can easily replace and consolidate underperforming commercial or open source MTAs. Free up IT resources with a proven platform that was specifically designed to overcome the challenges of today’s ever-changing sending environment. 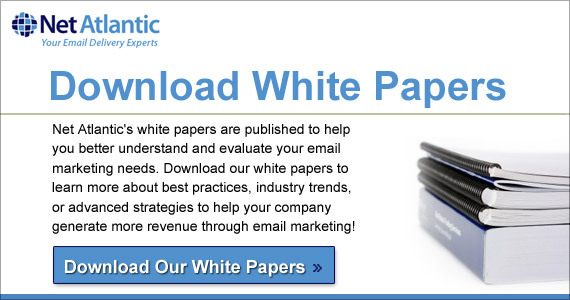 Net Atlantic’s white papers are published to help you better understand and evaluate your email marketing needs. Download our white papers to learn more about best practices, industry trends, or advanced strategies to help your company generate more revenue through email marketing! Practical and actionable advice for getting the most out of your email programs through improved strategy, content, testing and technical considerations. Five key trends to watch: Getting Your Email Moving with dynamic content, Tying it all Together with multiple mailings,Taking the Subtle Approach with a soft-sell, Leveraging Word of Mouth with forwarding incentives, and Let the Content Flow with a smart layout.